Samuel Moskovitch Arena in Côte Saint-Luc was the venue and hockey was on the agenda, but what transpired on the ice was an afterthought to the whole spectacle. A few hundred special needs students from Marymount Adult Education Centre and John Grant High School made their way to the arena to take in their first ever hockey game. “We also have students from over 75 countries learning French or English who have never seen a game. It’s part of our job to have them share the culture,” said Jacques Monfette, the principal of Marymount Adult Education Centre. This year it was a special needs student named Carlo who kicked off the event with the traditional opening puck drop. Carlo was at the Philip E. Layton School for the Blind and has been at Marymount Adult Centre since September. 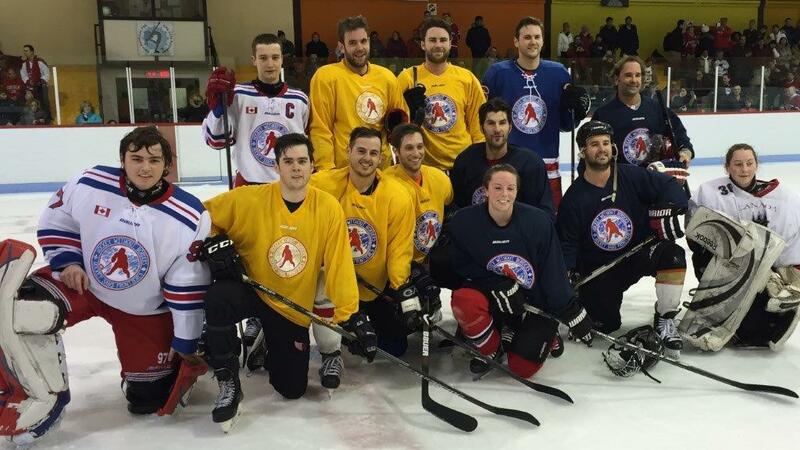 He and his friends relished the opportunity to participate in this year’s Hockey Day. Once the game kicked off, the arena was buzzing with excitement. For the first few minutes of the game, most students were on their feet cheering on the teams. If you didn’t know any better, one would think we were taking in a Montreal Canadiens game at the Bell Centre. However, Marymount’s second Annual Hockey Day would not have been possible without the help of Hockey WithoutBorders, who provided the teams for the game. “I told the organizer Scott Berish that I needed two teams and he came through for us,” said Monfette. Hockey Without Borders is a non-profit organization which looks to promoting health and activity to youth. For Berish it was all about showing everyone a good time. “I really hope they had fun because it’s just an amazing event,” he said. “For me, on the other hand, it’s more of a humbling experience. Myron Weekes, a teacher at Marymount Adult Centre, shares a similar sentiment to Berish. “I’m happy to see them go to a hockey game as it’s an opportunity that they don’t always have due to facilities and whatnot. It’s really a great inspiration and serves as an example to the rest of the community,” he said. This was the second Annual Marymount Cup and it appears to be staying for years to come. “We typically bring the students apple picking or to Cabane à Sucre but this event has become an annual thing for sure,” said Monfette. looking ahead to the future. When it was all said and done and the students boarded the buses back to their respective schools, no one even mentioned the score of the game. The fact of the matter was that, quite frankly, it didn’t matter. What truly mattered was seeing countless students revel in their first ever hockey game. لاتعرض الأثاث لأشعة الشمس لمدة طويلة , لأن الشمس تحدث فقدان المجالس لرطوبته الطبيعية . اهتم باختيار نوعية الأثاث الذى تقوم بشرائها لتسهل عليك تنظيفها ايا كان من الخشب اوالجلد لان كل نوع من المجالس له طريقة تنظيف .